To turn on the job costing or estimating feature in QuickBooks 2017, choose Edit → Preferences. Click the Jobs & Estimates icon on the left; click the Company Preferences tab; and then use the Do You Create Estimates? and Do You Do Progress Invoicing? radio buttons to tell QuickBooks whether, in fact, you want to do these things. You get this, right? You select Yes if you do and No if you don’t. 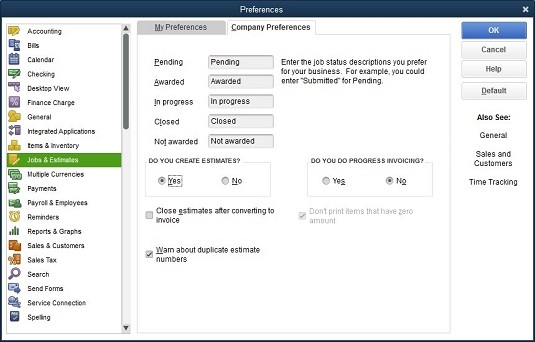 The Company Preferences tab showing job and estimate options. Progress invoicing (or progress billing) refers to the practice of billing or invoicing a client or customer as work on a project progresses. In other words, rather than invoice at the very end of a project, you might bill half the agreed-upon amount when work is roughly half done. Then you might bill the remaining half of the agreed-upon amount when the work is finally finished. While you’re looking at the Company Preferences tab, you’ll see that QuickBooks lets you categorize jobs as falling into five different status categories: Pending, Awarded, In Progress, Closed, and Not Awarded. As you might guess, you use these job-status descriptions to categorize your jobs.